Investigators haven’t said whether there’s a connection between the massacre of eight Pike County family members Friday and three “sophisticated" marijuana grow sites found near their homes . Crime scene tape surrounds a Pike County home. But as authorities search for who shot and killed members of the Rhoden family, there has been speculation that the execution-style homicides might have been motivated by Mexican drug trade. That theory is among several other possible motives that investigators have not yet confirmed nor denied. “We do not want to give the killers, or killer, any indication of where this case is going and what information we have or do not have,” said Attorney General Mike Dewine at a news conference Wednesday afternoon. Law enforcement agencies at many levels have reported an increase in violent crime linked to drug trade in the United States, fueled by Mexican cartels supplying U.S. drugs and the stateside gang members who help them do business. Dewine hasn't said if the marijuana operations found near the family homes could be linked to Mexican cartels, but he told WLW's Bill Cunningham Monday that "nothing is off the table." This isn’t the first time authorities in Pike County have discovered marijuana grow sites. And it isn’t the first time drug cartels have been top of mind in this small county. In 2010, state officials announced the seizure of 22,000 marijuana plants in the village of Latham — 15 miles west of Piketon — and said they suspected a connection to Mexican drug cartels. Then, in August 2012, Ohio law enforcement officers found “a major marijuana grow site in Pike County with suspected ties to a Mexican drug cartel,” according to a news release DeWine’s office issued at that time. Investigators discovered about 1,200 marijuana plants — which were destroyed — and they also found evidence of two abandoned campsites they believe belonged to Mexican nationals. 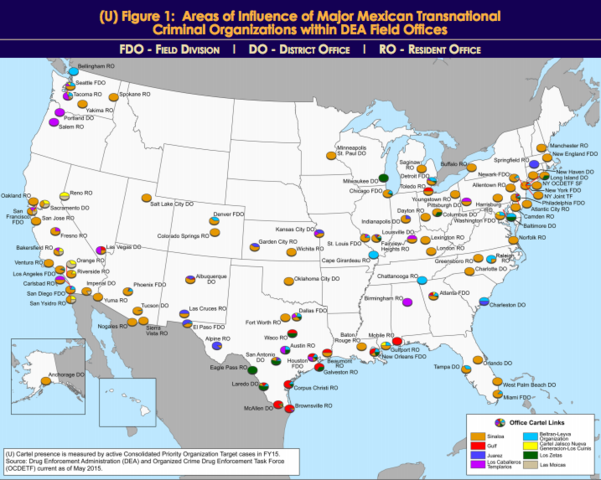 Mexican Transnational Criminal Organizations are "the greatest criminal drug threat to the United States,” according to the 2015 Drug Enforcement Agency national threat assessment report . The Mexican drug organizations traffic cocaine, methamphetamine, marijuana — and notably heroin — throughout the United States. “They are everywhere. They are fluid, and they extend their reach by working with local gangs. The cartels are like the wholesalers, and they work with the gangs to do the local retail distribution,” DEA spokeswoman Barbara Carreno said. Officials do not know how many U.S. cities have Mexican cartels working there, but they do track the areas where certain cartels are most active . Mexican cartels are directly linked to a rising heroin epidemic in Greater Cincinnati and throughout much of the country. Officials said the Sinaloa cartel is one of the key suppliers of heroin in the region through a pipeline that runs from Mexico to Chicago . But the law enforcement officials who work to take down the traffickers said cartel members rarely come here themselves. “Most of what we see in Cincinnati are what we would term middle men or entrepreneurs who buy their drugs from the cartels — whether it would be in Chicago or Atlanta — and then bring them to the Cincinnati area and distribute them,” said Brad Winall, commander of the Hamilton County Regional Narcotics Unit. That doesn’t mean law enforcement officials haven’t busted cartel members here, but it’s difficult for them to determine if they did. Tim Reagan, the resident agent in charge of the Cincinnati DEA, said his agents look for physical clues to identify links to cartels in the area. “Maybe we’ll be lucky enough that sometimes they’ll have a tattoo on their body associating them with a specific group, but realistically if they are honest with us about where they are from in Mexico, that would be the easiest way to (connect them to a cartel). Short of that, it's very difficult,” he said. Is Cartel Violence Prevalent Here? Cartels are violent in Mexico, and there are consequences when an associate does something wrong. Winall said he has watched that fear factor play out during investigations in Hamilton County. "We had a couple of individuals who came to Cincinnati, who had been recruited by the cartel. They came to Cincinnati to distribute heroin, but before they left their village in Mexico, they were told by members of the cartel that, ‘If you get arrested and cooperate with the law enforcement, then we will kill your family members.’ These individuals were absolutely convinced that if they cooperated, the cartels would kill their family members, which is something that they do regularly in Mexico,” he said. Reagan, the Cincinnati DEA leader, said some drug traffickers from Mexico bring violence with them to the states, but he hasn't noticed a major violence issue linked to cartels in Ohio since he started working here more than 12 years ago. "Are they armed? Yes. Are we seizing firearms or arresting people and executing search warrants? Absolutely — Mexican nationals. But the real violence against each other, I just haven’t seen it in the region,” he said. But that doesn't mean that violence can't happen. "The possibility is always there. We are dealing with drug dealers who have a significant amount of heroin, cocaine, methamphetamine in their possession here, so they are going to protect themselves from being robbed. They are going to protect themselves as they distribute,” Reagan said. Winall said he hasn’t seen the same level of retribution in Greater Cincinnati that exists in major cities like Chicago. "But certainly there have been homicides and deaths resulting from people who either don’t pay for their products or cheat people out of their products, and some of them probably are linked to cartel people,” he said. "But, you know, the key in any homicide investigation is to prove who did it and why they did it — not necessarily what affiliation they had with any particular group unless it’s a relevant factor there." Are Cartels Running Local Marijuana Grow Sites? Mexican cartels in the United States are starting to relocate from major metropolitan cities to suburban and rural areas to better conceal their operations from law enforcement, according to a 2015 DEA report . Cartels do have a history of running marijuana growing sites in the United States, but Winall and Reagan said it is unusual to see that in this region. He said it's likely that when cartels choose to grow marijuana in the states, it's to avoid getting caught while crossing the U.S. and Mexico border. "It may be cheaper to have a couple Mexicans sit, you know, camp in the woods for four or five months than go through the whole process of growing it there, packaging it up, getting it across the border, you know, paying for transportation up here and distributing it," Reagan said. Winall, who has not been involved in the Pike County case, said most of the people authorities in the area have arrested over the years for marijuana growing operations have been local, independent people. He said it would surprise him to see a cartel come into an area like Pike County to grow marijuana. "I can’t recall the last time we had a cartel and/or Mexican organization growing large amounts of marijuana in this area because it’s better grown in Mexico, where they don’t have the law enforcement, and they can grow so much more of it and then transport it across the border into the United States,” Winall said. Reagen declined to comment on the Pike County investigation or speak to whether or not it’s possible drug cartels are involved. He said he reached out to Pike County officials and Bureau of Criminal Investigations officials to offer DEA assistance.